*I was sent this album from One2One Network to facilitate my review. All opinions and deep love of Southern music are my own. Usually it takes me several times to listen through a complete album before I decide if I like it or not. That's not the case of "Amelita," the latest from Court Yard Hounds. If their voices sound familiar to you, that's because CYH is 2/3 of the group Dixie Chicks. After a few years away from the limelight and the Dixie Chicks, the two sisters, Emily & Martie, were ready to get back into the studio with the creation of Court Yard Hounds. 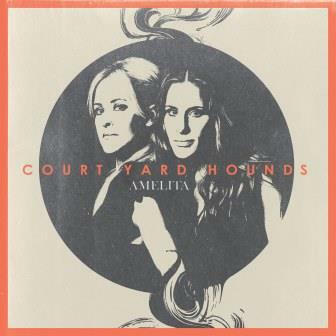 "Amelita", out now, marks the Court Yard Hounds' second album. The powerhouse duo celebrates the best aspects of Southern music - a little blues, a little old country, a little new country, a little bluegrass, a little rockabilly, a little gospel, a little Southern rock, even a little pickin' n' grinin'. Like a patchwork quilt - all different fabrics made into one cohesive work. Their harmonies are sometimes sweet and sometimes sassy but always evocative. There is such soul and conviction in what they are singing that I found myself tearing up out of the blue during "Get You Down." These ladies have always had a knack for storytelling in their music and this album exemplifies it. They so vividly spin a yarn and weave it into just the right mixture of melody and rhythm to make you feel like you are part of the tale. I really enjoyed the album from start to finish, but my favorite track was #5 "Guy Like You". If I closed my eyes, I could see me sitting on the front porch, sipping iced tea on a sultry Southern summer evening in a rocking chair with my hound dog by my side. If you want to grab a copy of "Amelita" for yourself, you can get it on Amazon or iTunes. I dare you not to walk away from this album humming "The World Smiles." Catchy tunes and rhythms, solid songwriting, and stellar musical ability culminates into a fabulous album. Great review! Definitely want to listen to a couple of the tracks you mentioned. Perfect on a Sunny day.